I sometimes wonder about a situation where someone uninitiated on F1, channel-hopping on their TV on a Sunday afternoon, happens upon the Abu Dhabi Grand Prix. What must their first thought be? They'd be forgiven for thinking that the cars were racing around an advanced future. 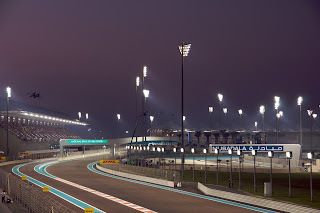 A brand new Hermann Tilke facility appears on the F1 calendar every year it seems, but even though this weekend will be F1's fourth visit to Abu Dhabi's Yas Marina circuit (making it positively long in the tooth in this ever changing sport) in terms both of its visuals and its facilities it remains a clear stride ahead of all other venues. Visually it is stunning: all gleaming, shimmering, towering architecture, the like that one would have more expected to see in a sci-fi film. Even among modern day ostentatious F1 venues it has a unique no-expense-spared quality. It has a icon all of this own in the Yas Marina hotel, which the track passes under, and shines in ever varying coloured lights which attract many a wide-angled camera lens. Add that it is F1's first and only day-to-night race and has a resultant twilight atmosphere and you have a heady mix. And in terms of F1 balancing its books it's clear where Abu Dhabi sits. The city of Abu Dhabi drips with money and, alongside Monaco and increasingly Singapore, Abu Dhabi is the event that F1's money providers, both current and potential, want to attend, entertain guests and do business at. The Paddock Club there is booked up far in advance, as is the deliberately Monaco-reminiscent harbour with room for 150 boats. Tickets also usually sell out, at the admittedly modest capacity of 50,000 (and in previous years some of these ticket holders appeared to attend the race disguised as empty seats). But as far as Sebastian Vettel and Fernando Alonso, and most others associated with F1, are concerned this weekend at Abu Dhabi the future is now, as the immediate matter of a critical round in deciding the destination of the 2012 drivers' championship will be at the forefront of their minds. And 'critical' is the word, as you feel that this is the weekend that Fernando Alonso simply must reverse Sebastian Vettel's recent momentum. If he doesn't, and Seb wins again (as he's heavy favourite to do), then Vettel's lead will be 20 points at least with only 50 remaining, meaning surely that only a freak occurrence such as unreliability can deny Seb his third world championship. And it could hardly be tougher territory for Alonso to try to get one over on Seb, as it's a track that Seb never fails to perform at. He has claimed victory in two of the three visits here and in the other he took pole only to be stopped by a puncture at the second corner. Add in that Seb and Red Bull have been at their imperious best in recent weeks, never missing a beat, and you'd be forgiven that thinking that this weekend is another foregone conclusion. Perhaps also the Yas Marina circuit's characteristics do not suit the Ferrari F2012: mainly slow and medium speed corners, acceleration zones and a low grip surface, none of which the red car likes (see Singapore). Worse for Alonso, it's a track on which overtaking often has not been easy (as Alonso no doubt knows from his 2010 experience here), which won't help the Spaniard who's tended to be stronger on Sundays than on Saturdays this year. On the other hand, DRS ensured plenty of passing here 12 months ago. And things might get even worse for Alonso, as there are also reasons to anticipate a strong McLaren showing. With Seb, Lewis Hamilton is another usually mighty around the Abu Dhabi circuit, particularly through the final sector of the lap where he controls the car's lively tail beautifully. He won in fine style at Abu Dhabi last year, came a close second here the year before and was on course for victory in 2009 before he was hobbled by a brake problem. And Jenson Button has never failed to finish on the podium at the Yas Marina circuit. The obvious risk to Alonso is that if a McLaren or two ends up between him and Vettel out front then Seb's championship march will be hastened. But is there cause for optimism for Alonso and Ferrari? The most obvious point backing this is that what we saw in the Indian race underlined in thick red lines that Alonso has absolutely no intention of ceding in the championship fight, and is summoning up all of his mighty race day ability (and more) to get on terms with the Red Bulls. Further, for the first time in a long time last weekend Ferrari's upgrades seemed to work and brought the car closer to the Red Bull, and the trend going back to Singapore is the Ferraris creeping up on the Red Bulls on pace. And apparently more goodies are expected from the Scuderia in Abu Dhabi. And for all we associate the Yas Marina track with Seb and Lewis supremacy, let's not forget that Alonso put in an excellent drive here last year also, finishing second in a car you suspect had no right to be near that spot. Further, Lewis Hamilton has been an unlikely cheerleader for Alonso's title bid out of the car in recent weeks, so if Lewis is at the sharp end this weekend he won't have any qualms about doing his best to ruffle Vettel's pristine feathers. Not that Lewis usually needs an excuse to get racy. By now Fernando Alonso, in championship terms, is a cornered animal. But what is it they say about the cornered animal being the most dangerous?